Are TVET and Apprenticeships a Second Class Education or a Game Changer? Our obsession with traditional degrees and an elitist policy of the Indian education system has hitherto treated the vocational sector as a ‘second-grade’ option – one for the electricians, carpenters, plumbers, and mechanics – for the not academically able who could not make the cut in the formal education system. We have coveted a university degree even if not aligned to our innate aptitude and abilities, valuing it more than becoming a skilled tradesperson. This limited, highly backward and erroneous mindset has for decades hindered us from appreciating that technical and vocational education and training (TVET) can be the silver bullet to the youth joblessness problem. India does not have a rich history in apprenticeships and TVET. This along with a deep-rooted mindset that does not consider vocational training worthy have contributed to low enrolments in vocational courses. What have been the reasons for these negative perceptions and are they now changing? Family expectations attached to vocational education and training related professions as ‘manual’ low-paying jobs for the not so bright. Parents who can afford it prefer to push their children to become university graduates rather than send them for vocational training. There is a sense of a lost opportunity cost for 2-3 years when enrolled in vocational training owing to limited choice for an individual to return to the academic stream at a later stage. This has contributed to the negative view of vocational training as a career cul-de-sac. Unlike in the USA, UK and Australia, the vocational and higher education sectors in India are almost completely segregated. Members on curriculum development boards have been mostly appointed on seniority rather than their current industry knowledge. This leaves a TVET pass-out with little relevant skills to match market demand. An increasing number of sectors are moving away from traditional work methods towards technology based solutions requiring specialised skills across trades such as, machine operators, welders, supervisors, technical support, among others. For instance, construction VET training is more effective if focused on specific skills such as bar binders, machine operators, skilled construction supervisors, building plumbers and electricians. Most vocational training has taught through an obsolete curriculum with limited hands-on training facilities rather than targeting contemporary industry specific knowledge and skills. Salaries of teachers in vocational education have been at the lower end of the teacher salary spectrum compared to teachers in secondary education. Frequently, teachers themselves lack the required skills and qualifications to impart specialist trade knowledge. Industry reluctance to partake in in-house vocational training or hiring skilled workers (compared to an unskilled cheaper worker) has led to a wage disparity between different skill levels. 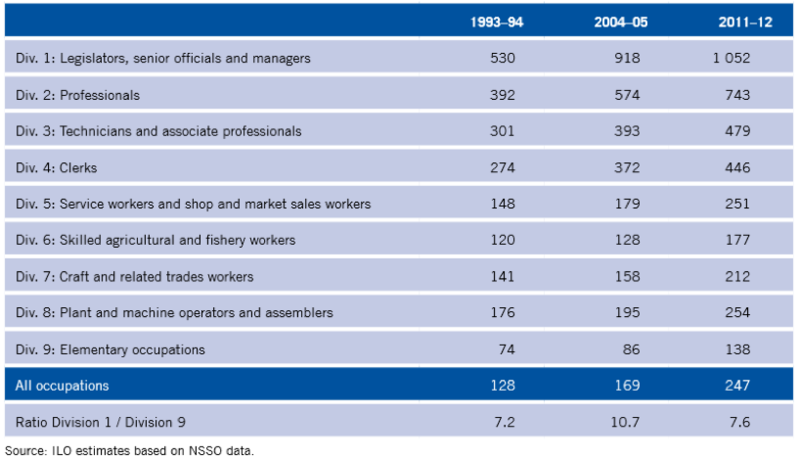 A low-skilled worker earned 60% below the average salary, a medium skilled worker 0.7 -1.8 times above the average pay, while high-skilled occupations attracted 1.9 – 4.3 times higher than average earnings.3 However, interestingly, if we compare wage changes from 2004-05 to 2011-12 we see the highest increase of 60% in the lowest division (elementary occupation), a 40% increase in wages for service workers (middle half), whereas the highest two professions saw a jump of 14.6% and 29% in average daily wages. Hence, although the general perception has been of low pay, indeed there is a wide gap between the top and the bottom. A sweeping perception of vocational trade as low skilled and low valued is therefore a limited view in light of new workforce dynamics and appreciation of sought after trade skills. Fortunately for us, recent strides are beginning to turn the table, and today, we are able to sense a gradual but definite change in mindset due to a concerted effort to bring about large scale improvements and a vibe of positivity in vocational education in India. The image of TVET and apprenticeships is the collective responsibility of all stakeholders. Let’s look at some important factors responsible for the perception shift. In 2014 important changes were made to the Apprentice Act 1961 with a view to make TVET education a secure and fruitful livelihood option at the heart of an innovative and fast moving economy. Namely, widening the scope and definition of apprenticeships, flexibility to hire 2.5-10% of a company’s workforce through the apprenticeship route, government contributing to 25% of stipend costs, removing punitive punishments on employers for perceived breaches of the apprenticeship law, allowing businesses to design their own skill programme, a centralised online registration system, have been some noteworthy changes. Additionally the introduction of schemes such as the National Apprentice Promotion Scheme (NAPS), the National Apprentice Training Scheme (NATS), and the Pradhan Mantri Kaushal Vikas Yojana (PMKVY) are already raising the attractiveness quotient. Companies such as Bosch, Tata Steel, Larsen & Toubro, Bharti Group, Hero Group, Maruti, Infrastructure Leasing & Finance Services Ltd., among others, already offer world class training programs in established training facilities. The impact of such training has been enormous on the lives of skilled youth who in turn have become advocates of such a system. Further drumming up the positive vibe around vocational education is the ‘Fark Dikh Raha Hai’ @MSDESkillIndia campaign by the Skill India mission. Mr. Manish Kumar, MD & CEO, @NSDCINDIA says, “We are confident that through this campaign we will be able to raise awareness and aspirational value of vocational training in India.” Click here to watch how the campaign is spreading the word. Recognising hands-on skill on a national and global platform is helping build appreciation of the value and opportunities apprenticeships can offer. WorldSkills India, initiated by @NSDCINDIA has given opportunities to skilled individuals across sectors to showcase their talent at the national level thereby leading the country’s participation at the WorldSkills International stage, which is the largest international vocational skills competition. In WorldSkills Abu Dhabi 2017, India took home one Silver, one Bronze medal and nine Medallions of Excellence, impressing the world with its talent. Arun Raj comes from a humble background. Arun started working in an ad agency at a very young age to support his family and to take care of his studies. 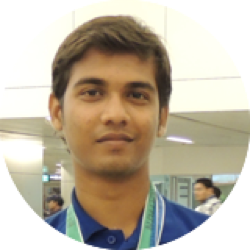 He participated in World skills India conducted by NSDC and represented the country in WSI 2013, Leipzig, Germany. Life changed for Arun after winning a ‘Medallion for Excellence’ at Leipzig. He became an inspiration for his peers. He was offered a job by an MNC with pay above his expectations. He was approached by many CEOs to join their design team. Arun says these experiences have taught him to dream big and never to settle. He signs off with a big thank you to everyone who’s been part of his World Skills journey! In all, the seeds of positivity have been sowed and it is heartening to see an increase in the uptake of vocational education especially in the last three years reinforcing a buy-in both by employers and candidates. There is still much scope to improve the attractiveness of TVET and apprenticeships. But it has been a positive start, one that we hope will continue.